Dental impressions are a fact of life if you need traditional braces, a crown, partial denture or other restorative or replacement dental service. Unfortunately, oral impression material is often gooey and messy, making people with sensitive gag reflexes and small mouths uncomfortable. 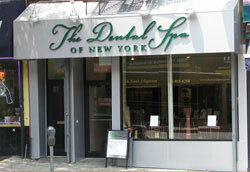 Dr. Frank Sapienza, dentist in Park Slope, offers digital impressions using an innovative intraoral scanner. Results are precise, and patients can actually enjoy the restoration experience. Why Make a Dental Impression? To make this three-dimensional image, the dentist fills an impression tray with a thick, elastic impression material. He places it over the the upper or lower teeth and the patient closes his lips over the tray, holding it in place for several minutes. What results is a negative image of the teeth and gums which the dental technician fills with a plaster-like material to create the three-dimensional model. Used for decades, dental impressions accurately render the size, shape and arrangement of teeth and gums. However, they have patient comfort drawbacks and take time to fabricate. 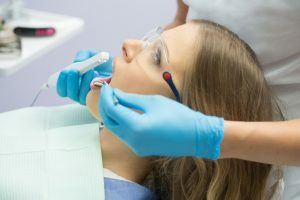 That’s why the staff at The Dental Spa of New York enjoy a new technology Dr. Sapienza uses for his restorative and cosmetic dentistry patients. It’s the Carestream CS3500 Intraoral Scanner. This amazing machine takes 2-D and 3-D images of the patient’s entire oral cavity and places them for almost instantaneous viewing on a chairside monitor. Quick, easy to use and comfortable for the patient, the Carestream Intraoral Scanner digitally visualizes teeth, gums, tongue, palate and other oral structures in color with amazing detail. You and Dr. Sapienza will be able to see what needs to be done to restore or beautify your smile and how the restorations or cosmetic services can accomplish it. The images are great teaching tools, and patients come away with a better idea of how their dental work will proceed and look when it’s finished. Are you in need of porcelain veneers, a crown, dental implant or other complex dental work? Don’t dread your time in the chair. Dr. Sapienza and his team make it easy with digital impressions and other modern dental technologies. You’ll be pleased with the results! Contact The Dental Spa of New York, your dental office in Park Slope, for your personal consultation with Dr. Frank Sapienza.